Since the vertical jump is an explosive movement, both strength and power need to be developed. Learn the proper training and exercises for increasing your vertical jump here. The most common question I hear from young athletes concerned with improving performance is “How can I jump higher?” Jumping is an explosive movement that can, believe it or not, be improved with proper training. The definition of vertical jump is the jump reach minus the standing reach. The “standing reach” is how high you can extend one arm above your head while keeping both feet together and flat on the floor. The jump reach, for a true vertical jump test, is to jump straight up without taking a step and touch the highest point possible. I hear people talking about vertical jumps above 40 inches, but those are not true vertical jumps. Most NBA players have vertical jumps in the 28 – 34 inch range. The highest I have ever tested is 36 1/2 inches. Ironically, it was not a basketball player, but an Olympic triple jumper from Greece. Since the vertical jump is an explosive movement, both strength and power need to be developed. Strength exercises are slow, controlled movements. The best strength exercises for increasing the vertical jump are squats, lunges and step ups. These are the best because they are compound movements, which work the knee joint and the hip joint at the same time. Let’s take a look at each of these exercises. It is very important that you understand how each is performed, as described below. Squats are the best exercise an athlete can do for strength if it is performed correctly. If not, it can be the most dangerous exercise. When working with young athletes, I see that 9 out of 10 squat incorrectly. This will lead to injuries, not improved athletic performance. The two main problems are: an excessive forward lean of the upper body (which can cause low back injuries) and excessive forward movement of the knees (which can lead to knee problems). The bar across the upper back (on traps and shoulders, not the neck). The chest out and the back tight with a slight forward lean. The knees stay directly above the feet at all times. Sit back deep to parallel, keeping weight on the heels. Before attempting squats, have a trained professional analyze your technique to make sure it is fundamentally sound. Concentrate on technique, not how much weight you can lift. Step ups are performed with dumbbells and a step-up box or bench (usually 16 inches – 18 inches high). Standing in an upright position holding the dumbbells, you step up on to the box or bench at the height that would put your knee at a 90-degree angle. Do 10 repetitions with one leg and repeat with the other. Lunges can be done holding dumbbells or with the bar across your upper back. Standing in an upright position, step as far forward as possible with no forward lean of the upper body until your front knee is at 90-degree angle. Then step back to the original position in one step. Do this 10 times with one leg, then 10 with the other. Steps and lunges complement squats because they work each leg independently. Power exercises involve explosive quick movements. They include power cleans, plyometrics and weight box jumps. Let’s take a look at each of these exercises. Power cleans are an advanced technical exercise. It is one portion of the Olympic lift, the clean and jerk. I highly recommend assistance from a certified strength and conditioning specialist (C.S.C.S) before attempting power cleans. Plyometrics are explosive bounding, hopping and jumping drills. They bring together the strength and speed components for increased power. Plyometrics must have maximum effort for results. 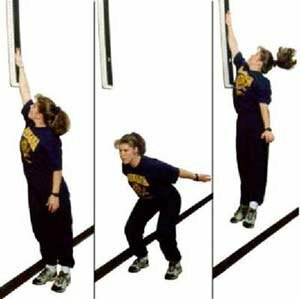 Practicing maximum vertical jump will increase vertical jump. With consistent, proper training, I have seen young athletes increase their vertical jump by 6 inches in one summer. Good luck with your training and may you fly as high as Mike! Previous Post Here are 10 exercises for developing explosive strength and power for the sprint/jump athlete.